For this poolside limestone paving project our client asked us to come up with a design to incorporate an endless, counter-current pool. 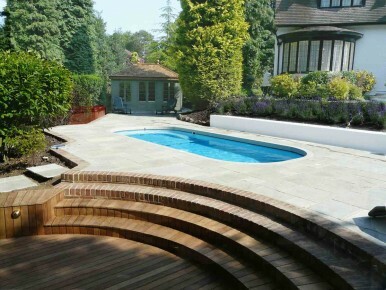 Accuracy was vital in this project, where there was a minimum tolerance of 3mm and all drainage falls were crucial, due to the levels of the swimming pool. Paving can be laid in any pattern. Our team can design your paving for you or work with external designers to produce your perfect paving for pools, patios and other areas. Contact us to talk about how we can help to lay the perfect paving for your garden.